PLUS unit mounted in a larger control box for easier mounting. Brake safety toggle switch mounted in a larger box for easier use. 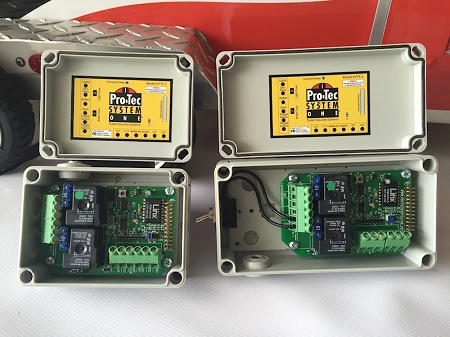 The PRO-TEC System is designed to monitor and protect the trailer and it's contents. 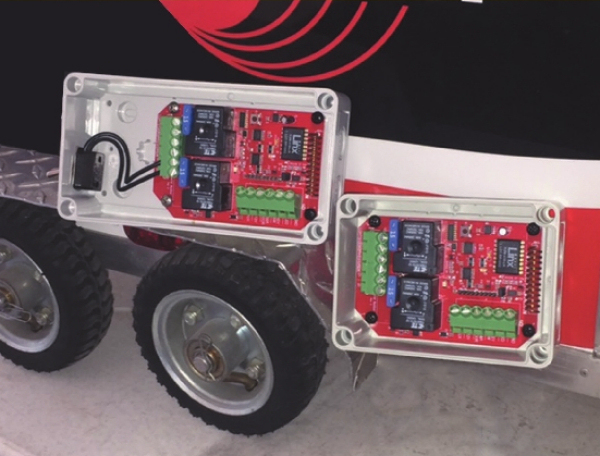 Any movement of the trailer will be detected by the built in, adjustable acceleromter, or the opening of a door. This will cause the electrical brakes of the trailer to be applied in addition to the sounding of the 120+db waterproof siren provided, and the flashing of your trailers running lights. The optional paging system automatically pages you when the alarm becomes activated. This provides you with up to one mile area of notification. Gone are the days of looking out hotel or restaurant windows to check the trailer or trying to find your crew or drivers at the track. By use of the manual pager button you or your crew can be alerted that you are needed back at the trailer. The paging system has three parts. The transmitter unit and manual paging button located inside the trailer, and the pager unit attached to your person. Several pagers can function with one transmitter, allowing your entire crew to be in contact at the touch of a button. The PTS-2 has an additional optional feature by using an interior keypad to arm and disarm. The keypad is user friendly and easily programmed. The PTS-2 is also equipped with a low battery alert system. The system is remotely controlled and comes complete with all hardware and universal door switches. You supply the wire and an automotive type battery, preferably mounted inside the trailer. With the optional pager, you supply an AM / FM antenna. Or you can utilize your existing antenna. Optional switches and motion detectors are available for professional installations. (Motion detector is to be used to sense motion inside the trailer, NOT the motion of the trailer). Motion detector has both K-band microwave and PIR technology. PRO-TEC System has been designed specially for easy installations. The cellular system automatically notifies two different people via e-mail or text when the alarm becomes activated.